Fat Bruce Lee had tried a Gordon Ramsay burger in NYC at The London, and he came back with a strong report. 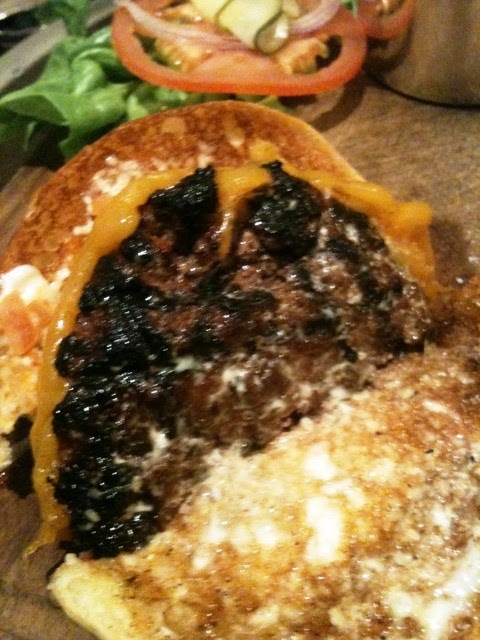 The photographs were of a deep, dark sear, and Fat Bruce Lee (Chief Burger Scout) told me that it was a terrific burger. He didn't bother doing a review, since we had a location in Los Angeles to try. We made our way to the West Hollywood hotel, The London, where Chef Ramsay had set up shop. 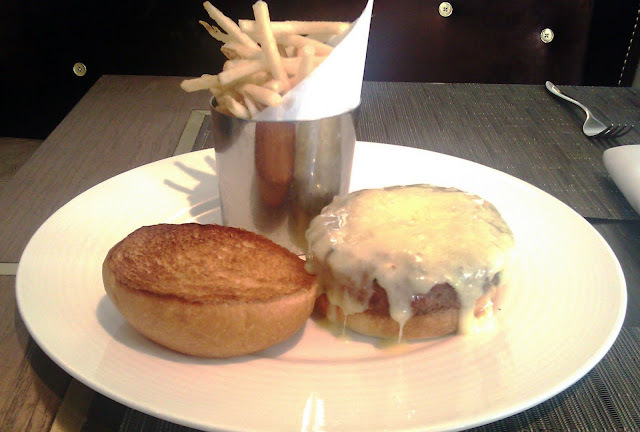 The burger was identical for both hotel restaurants, Boxwood Cafe and Gordon Ramsay At The London. The same burger was served to hotel guests as an in-room dining option. In fact all three venues shared a common kitchen. In spite of the hefty $17 price point, we pressed on and ordered a couple of the signature, The London Burger, cheeseburgers. Our burgers arrived in about 20 minutes. While we waited, we enjoyed the freshly-baked rosemary bread with an olive-oil infused crust....this was delicious...sadly, that was about as good as it got. The kitchen's first attempt at the Medium burgers was to deliver them cooked to an aggressive Well-Done. Fat Bruce Lee powered through his while I waited for a re-fire. 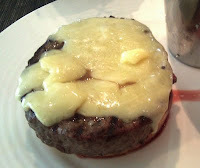 By the time my burger arrived, this time merely over-cooked to Med-Well, Fat Bruce Lee had already finished his meal. While I was killing time trying not to watch Fat Bruce Lee have at his cheeseburger, I remembered a few episodes of Kitchen Nightmares during which Chef Ramsay got completely bent out of shape over gum on the undersides of the tables in the various restaurants. I checked my table and the one next to it, and both had wads of gum stuck to the undersides...ouch. The Beef: The burger beef at The London was 80:20 Chuck--yep, 17 buck Chuck. It was not aged, and it arrived pre-ground. Remember, we eat hard so that you don't have to. The Chuck was only moderately beefy, and that was as interesting as it got. There was no trace of aging. My burger was very juicy...on the second try. It saturated the bottom bun, which turned that into a paste. The beef was either over-manipulated, or it had been pressed firmly into the circular burger molds and set aside for longer than 24 hours. As a result of the proteins in the beef making lots and lots of new bonds due to the poor preparation, the patty was springy and too chewy. The beef was priced well beyond its quality. Bite through the mushy bottom bun. Chew through the bland, cartilage-peppered, springy Chuck. Discover more salt in the Grafton Cheddar. The Sear: There was no sear. The Well-Done version of my burger, pictured left, sported lackluster grill marks. The Med-Well version was less impressive. This was a stark contrast and an even starker disappointment considering the beautiful sear that the NY crew got on the same burger...pictured above. The Preparation: The crew at The London kitchen over-cooked all three burgers on a too cool, gas grill. The low cooking temperature resulted in the burgers being unseared. 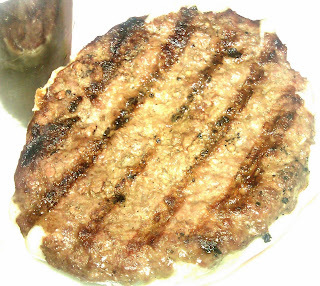 Also, the completely cooked layer of beef extended far too deeply into the patties. This resulted in a chewy, nearly rubbery, dish. Beyond that, the kitchen over-seasoned the burger patties. The preparation was careless. Fat Bruce Lee quipped, "This was a classic case of an upscale restaurant throwing a burger on the menu and giving it no love." In my opinion, he was being generous. The Cheese: The Grafton Cheddar was a superb, salty, creamy, sharp, white Cheddar. It was a complete mismatch for the bland Chuck burger patty. The cheese overwhelmed the mild beefiness of the patty. This cheese needed a dry-aged Sirloin to do battle with on the palate. The 17 dollar price certainly warranted a cut of beef of a quality that would have matched the powerful cheese. Note that the photo above is from the first attempt at delivering a burger cooked to the requested temperature. On the second try, the cheese was not nearly as neatly arranged, and it was only half-melted. See the far less attractive presentation below. The Bun: The house-made brioche was nearly competent and completely unremarkable. It was completely neutral in terms of flavor, but it was nicely toasted. The bottom bun was useless when it came to standing up to the juices from the burger patty. The bottom bun was reduced to a pasty goo during the short trip from the pass to the table (on the second try). Note (below) that the burger arrived sitting in a pool of its own juices, so it was nearly guaranteed to be soupy. Since the top bun was oiled, there was no way to grasp this wet mess without needing to frequently wipe one's hands. The Meat To Bun Ratio: The top bun worked, but the bottom bun failed. This was not so much a ratio issue, but a careless choice of ingredients. The Fries: The house-cut, skinny, peel-on fries were excellent. They were perfectly crisped in a blend of 75% canola oil and 25% olive oil. They were also perfectly seasoned. The Toppings: The Iceberg lettuce was average although on the first attempt, it was a little wilted along the uncut edges. The standout topping was the roasted tomato slice. This was roasted with balsamic vinegar and basil, and it was tremendous. I set aside half of my salty, wet burger, and I made a sandwich with the rosemary bread and that slice of roasted tomato. That impromptu treat was FAR preferable to the cheeseburger at The London. The Value: The value was poor enough to drag down the rating of this solidly unlikable burger. The London Burger was a pasty, chewy, salty, 17 buck, Chuck puck. The total bill with a bottle of water ($9) and three sodas ($18) came to $76, with tip. It felt like Gordon Ramsay had personally stolen my lunch money...for the month. The value was atrocious. 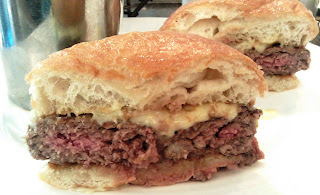 The London Burger at Boxwood Cafe was bordering on OK, but it was over-seasoned and over-priced. 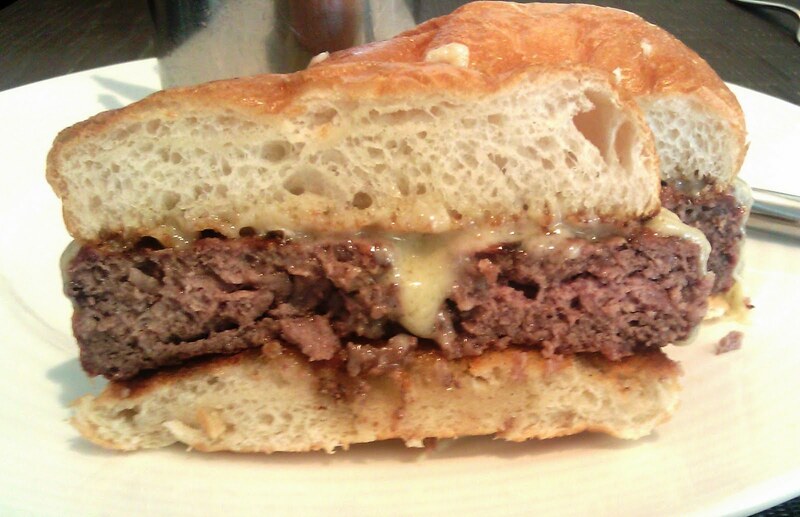 Beyond that, the bun and cheese were both poor matches for the beef. They got us, but don't let them get you. This is one burger, which can safely be passed by. It was a less than average in terms of freshness of ingredients and preparation, and well below average in terms of value. 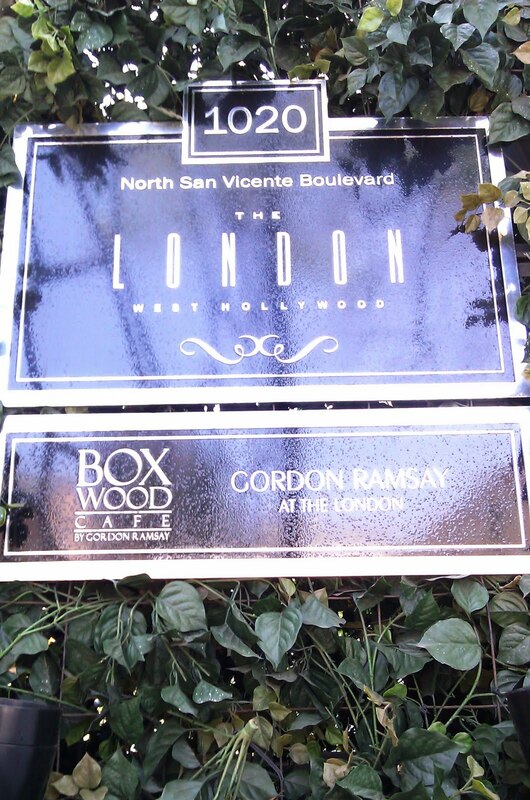 Gordon Ramsay's Boxwood Cafe at The London of West Hollywood was a bit of a kitchen nightmare in its own right. This review was particularly exacting, but in this case it was deserved considering the chef behind this burger had a made a reputation touting the use of great ingredients and holding restaurants and chefs to exacting standards of quality and cleanliness. For a good, high-end, classic cheeseburger....save a ton of money, and go to Wolfgang's Steakhouse in Beverly Hills for a much better burger at a much better price. Burger Review : The London Burger was a solid PASS. This was about what one would have expected of a room-service burger, but well below what should have been served in the restaurant. Boxwood Cafe was kitchen nightmare in its own right. Great blog. Ramsay got f'ing owned.